Quotations about Argumentation. Quotes to stimulate mind and drive action! Use the words and quote images to feed your brain inspiring things daily! 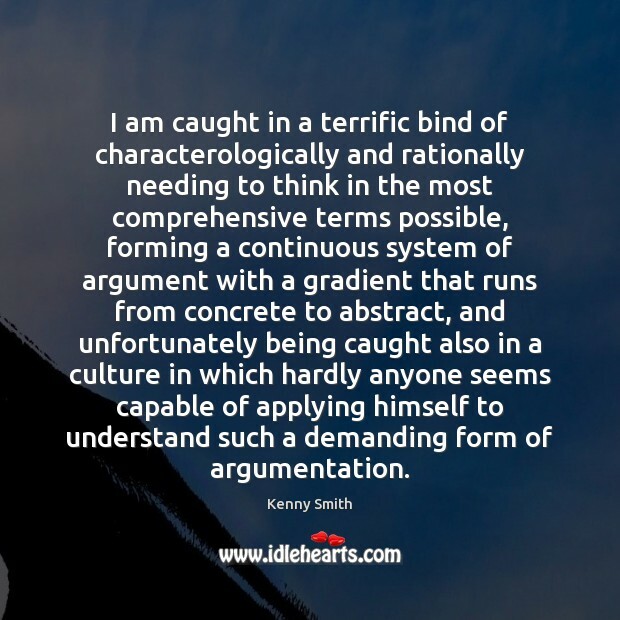 I am caught in a terrific bind of characterologically and rationally needing to think in the most comprehensive terms possible, forming a continuous system of argument with a gradient that runs from concrete to abstract, and unfortunately being caught also in a culture in which hardly anyone seems capable of applying himself to understand such a demanding form of argumentation. This splendid book discusses how, in the last two hundred fifty years, large numbers of people have achieved levels of well-being that were previously available only to a few individuals, and how this achievement has given rise to equally unprecedented inequalities. 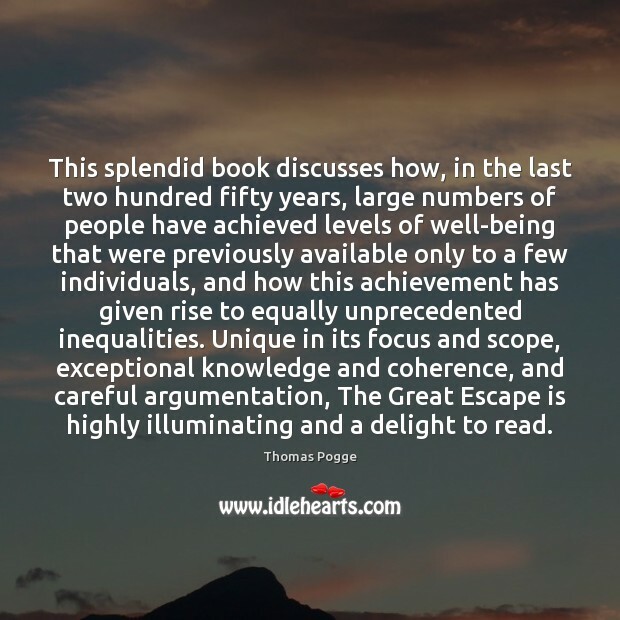 Unique in its focus and scope, exceptional knowledge and coherence, and careful argumentation, The Great Escape is highly illuminating and a delight to read. In learning and argumentation, the quality brain is similar to a facility of maximum security. 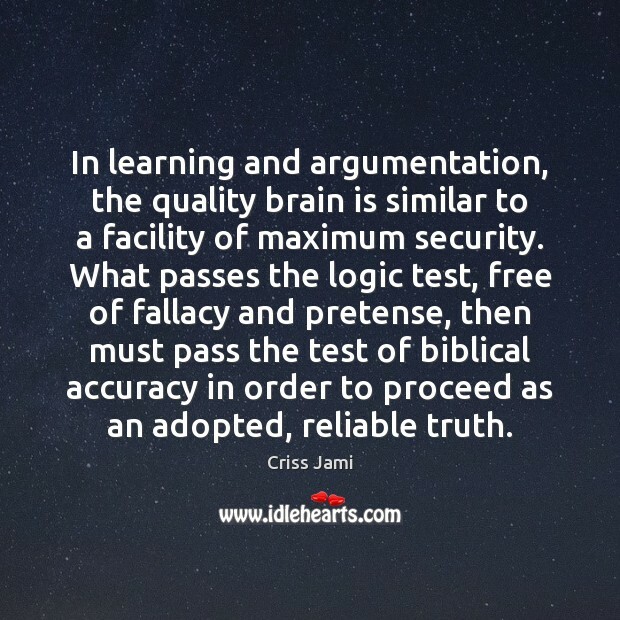 What passes the logic test, free of fallacy and pretense, then must pass the test of biblical accuracy in order to proceed as an adopted, reliable truth. 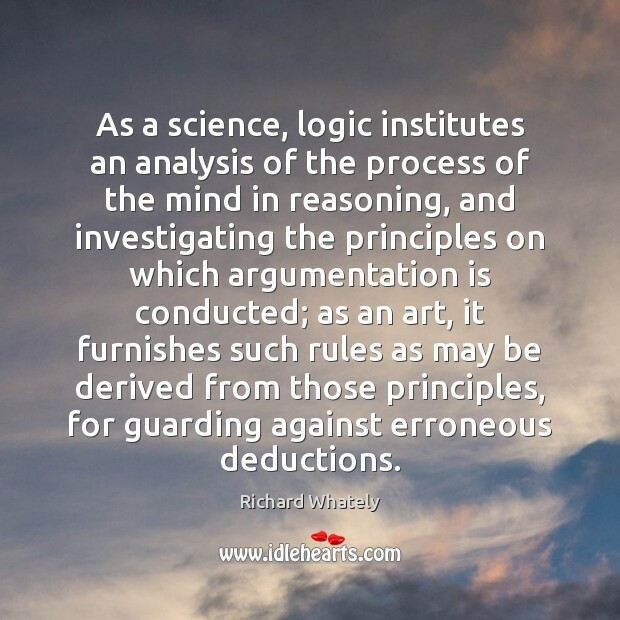 As a science, logic institutes an analysis of the process of the mind in reasoning, and investigating the principles on which argumentation is conducted; as an art, it furnishes such rules as may be derived from those principles, for guarding against erroneous deductions. 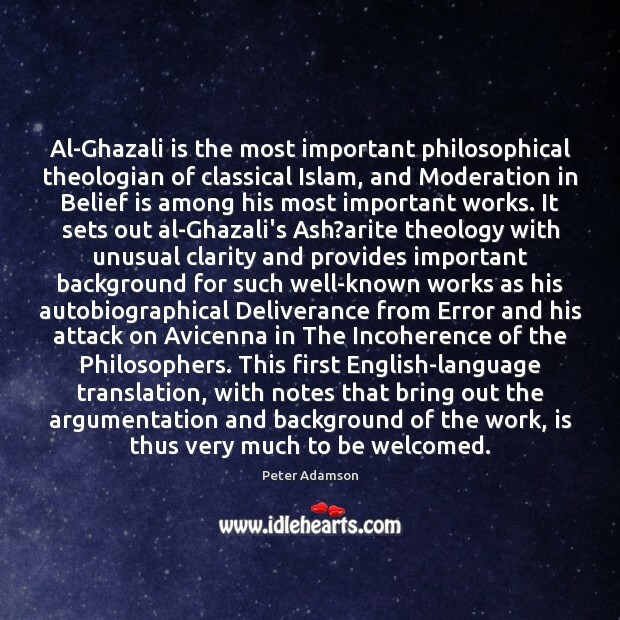 Al-Ghazali is the most important philosophical theologian of classical Islam, and Moderation in Belief is among his most important works. It sets out al-Ghazali's Ash?arite theology with unusual clarity and provides important background for such well-known works as his autobiographical Deliverance from Error and his attack on Avicenna in The Incoherence of the Philosophers. This first English-language translation, with notes that bring out the argumentation and background of the work, is thus very much to be welcomed. Do not dispute with anyone in any matter as far as possible. 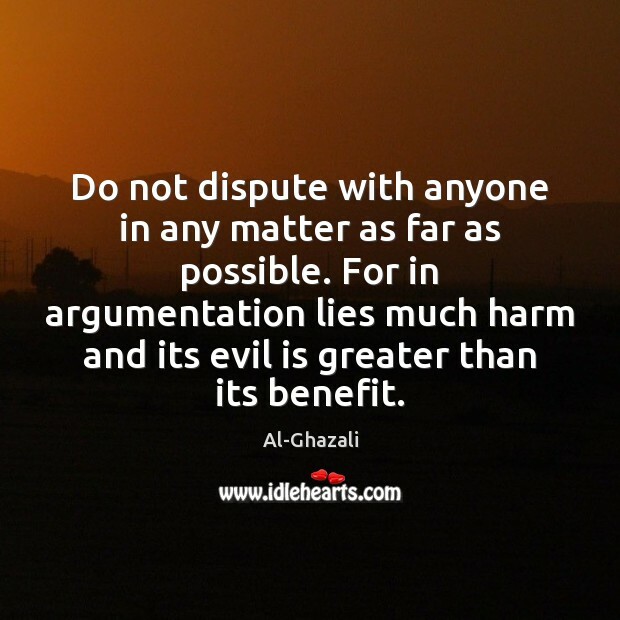 For in argumentation lies much harm and its evil is greater than its benefit. 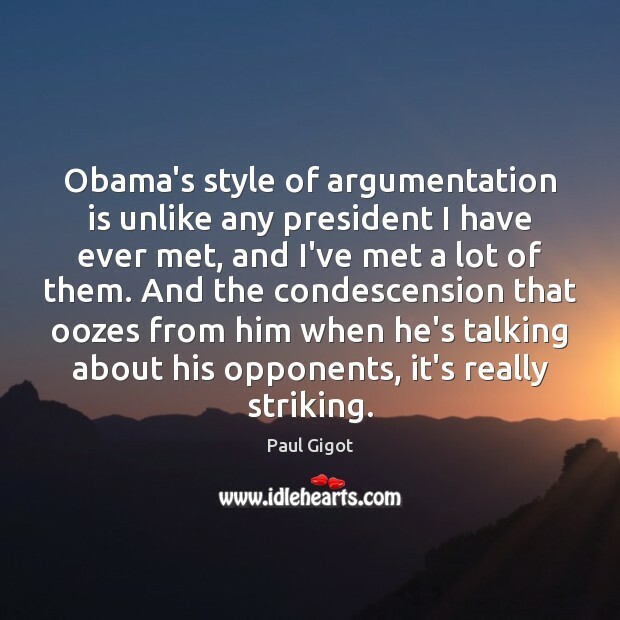 Obama's style of argumentation is unlike any president I have ever met, and I've met a lot of them. And the condescension that oozes from him when he's talking about his opponents, it's really striking. 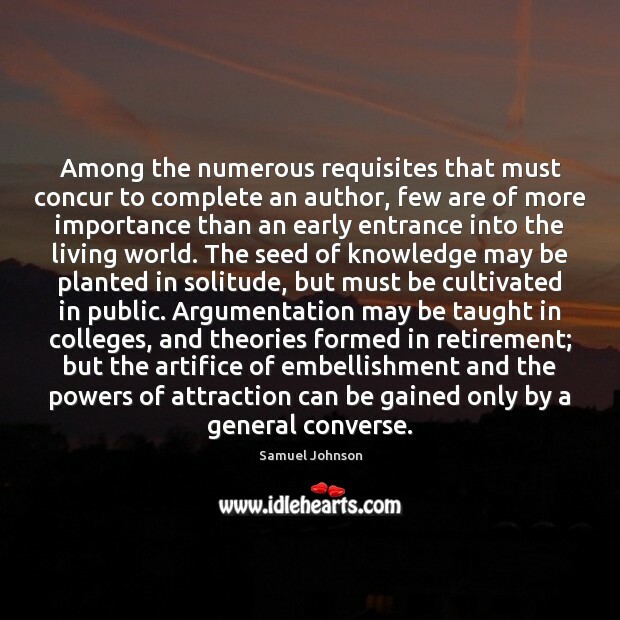 Among the numerous requisites that must concur to complete an author, few are of more importance than an early entrance into the living world. The seed of knowledge may be planted in solitude, but must be cultivated in public. Argumentation may be taught in colleges, and theories formed in retirement; but the artifice of embellishment and the powers of attraction can be gained only by a general converse. 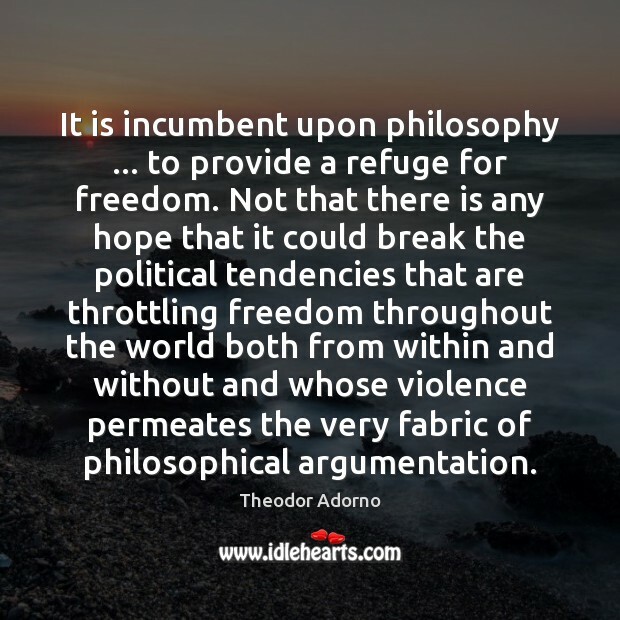 It is incumbent upon philosophy ... to provide a refuge for freedom. Not that there is any hope that it could break the political tendencies that are throttling freedom throughout the world both from within and without and whose violence permeates the very fabric of philosophical argumentation. I would call the attention of the reader to the difference between "reason" and "reasoning." Reason is a light, reasoning a process. 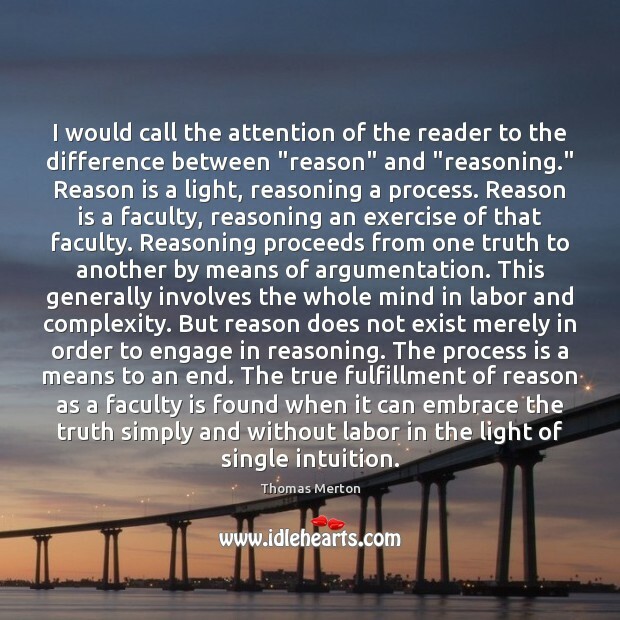 Reason is a faculty, reasoning an exercise of that faculty. Reasoning proceeds from one truth to another by means of argumentation. This generally involves the whole mind in labor and complexity. But reason does not exist merely in order to engage in reasoning. The process is a means to an end. The true fulfillment of reason as a faculty is found when it can embrace the truth simply and without labor in the light of single intuition. 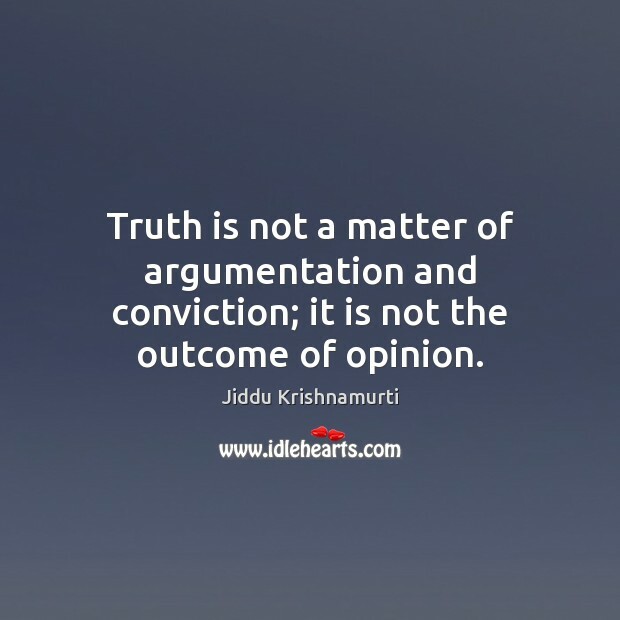 Truth is not a matter of argumentation and conviction; it is not the outcome of opinion. 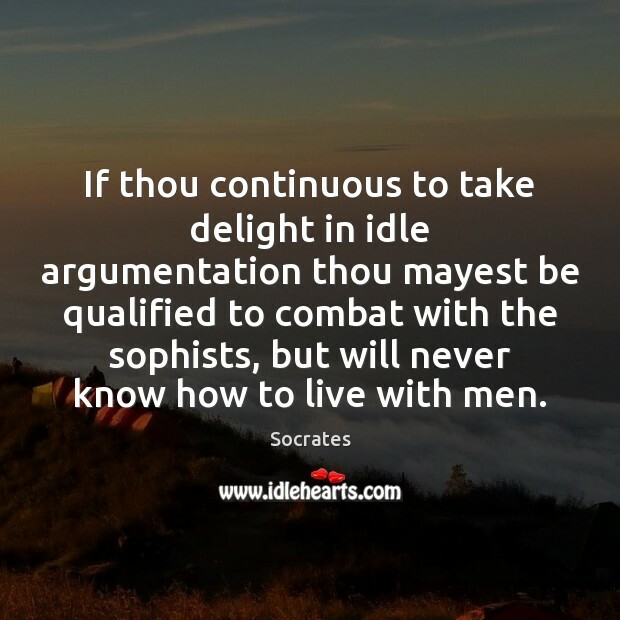 If thou continuous to take delight in idle argumentation thou mayest be qualified to combat with the sophists, but will never know how to live with men. 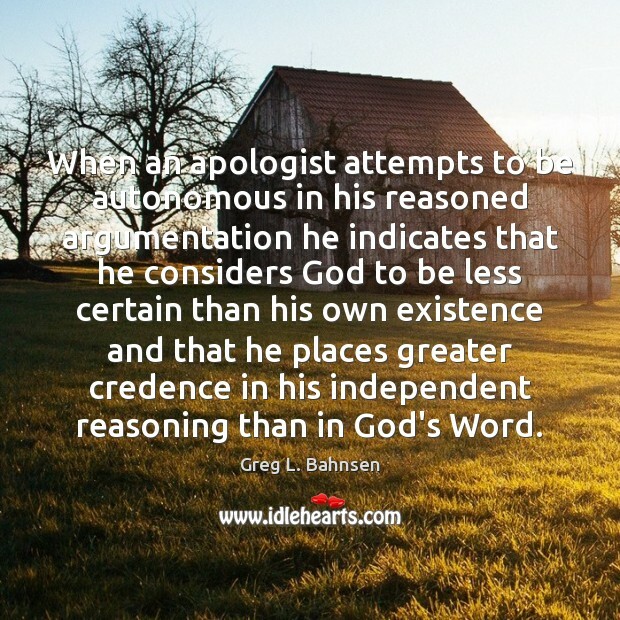 When an apologist attempts to be autonomous in his reasoned argumentation he indicates that he considers God to be less certain than his own existence and that he places greater credence in his independent reasoning than in God's Word. 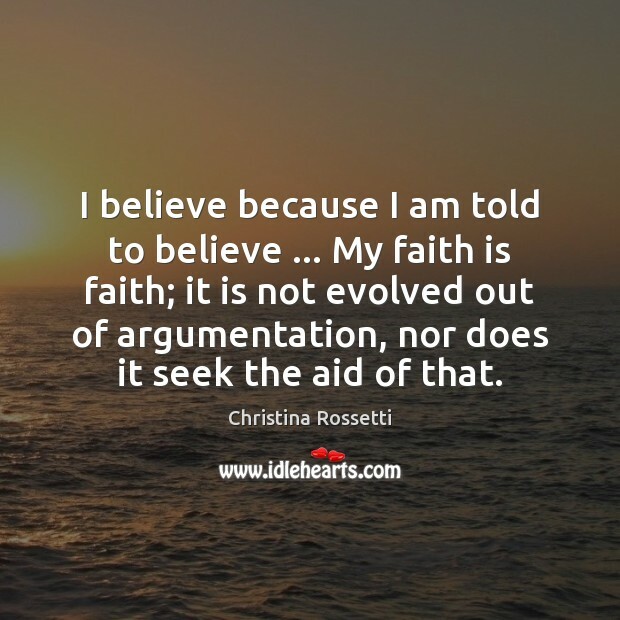 I believe because I am told to believe ... My faith is faith; it is not evolved out of argumentation, nor does it seek the aid of that. 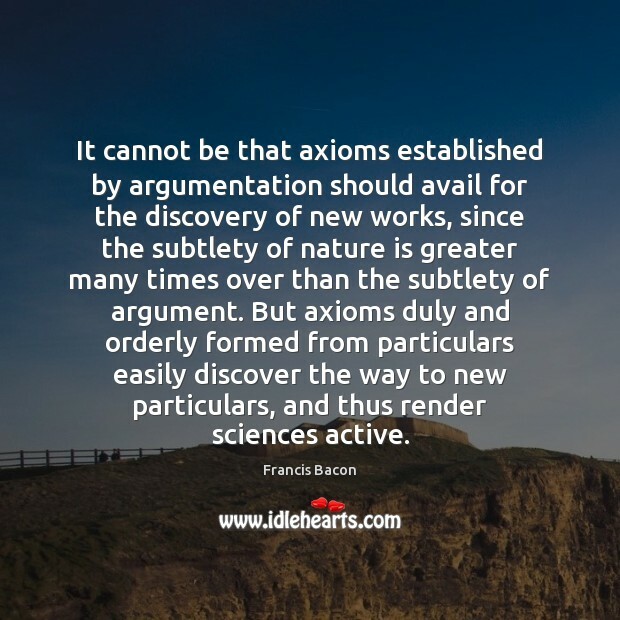 It cannot be that axioms established by argumentation should avail for the discovery of new works, since the subtlety of nature is greater many times over than the subtlety of argument. But axioms duly and orderly formed from particulars easily discover the way to new particulars, and thus render sciences active. 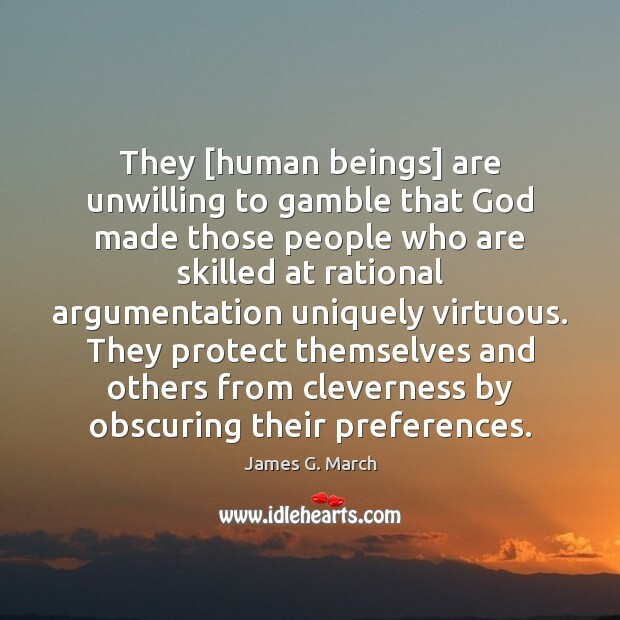 They [human beings] are unwilling to gamble that God made those people who are skilled at rational argumentation uniquely virtuous. They protect themselves and others from cleverness by obscuring their preferences. [Not parroting.] 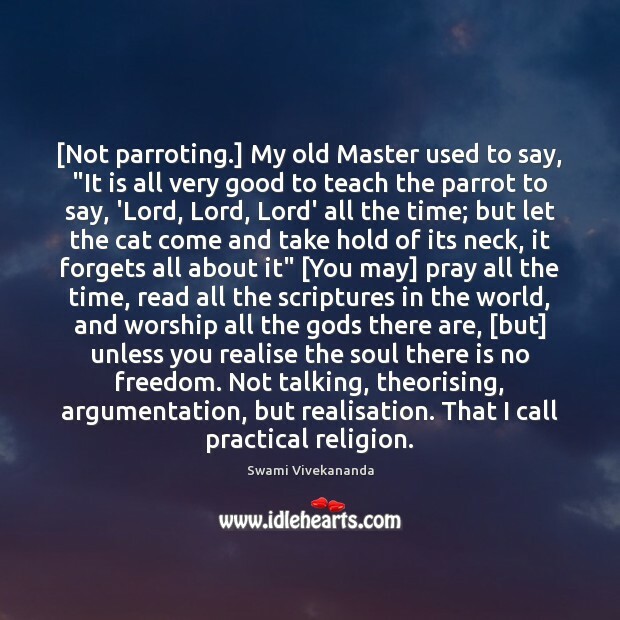 My old Master used to say, "It is all very good to teach the parrot to say, 'Lord, Lord, Lord' all the time; but let the cat come and take hold of its neck, it forgets all about it" [You may] pray all the time, read all the scriptures in the world, and worship all the gods there are, [but] unless you realise the soul there is no freedom. Not talking, theorising, argumentation, but realisation. That I call practical religion.